This is an easy one challenge to add anything starting with an “R’ on your project – the possibilities are endless! As I spent the whole weekend with fabulous friends at the 2017 Stampin’ Up! Onstage Event in Melbourne, I didn’t have a huge amount of time to be super creative. I decided so go simple with roses and ribbon on my card. The roses I’ve stamped are from Graceful Garden. My roses are coloured with So Saffron and Crushed Curry Inks. The leaves are cut with dies from Seasonal Layers Thinlits Dies. I’ve used Old Olive cardstock for them. 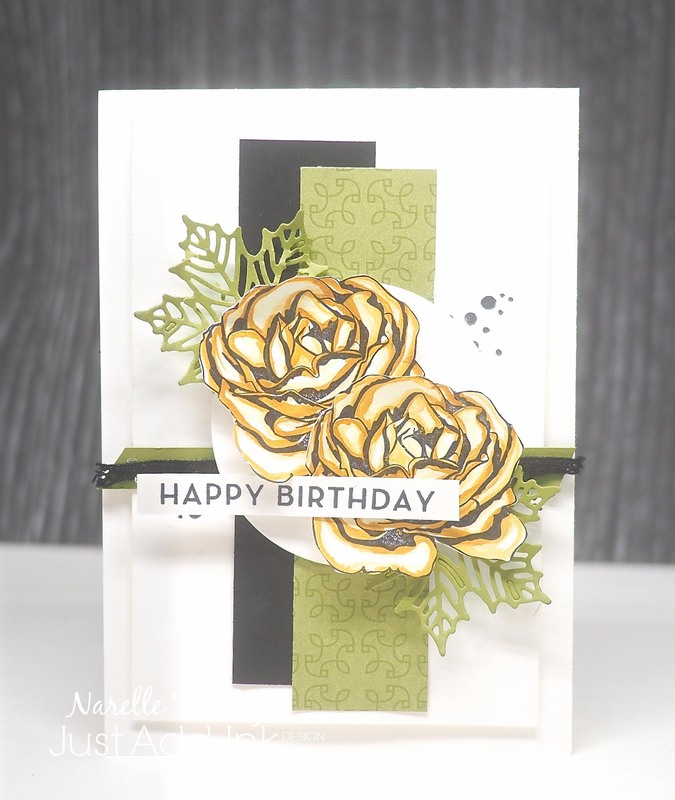 The strip of designer series paper I’ve used is from Petal Garden Designer Series Paper Stack. I then added a strip of Basis Black cardstock for another layer – just because you can’t have too many layers! To add some ribbon, I added a thin strip of Vintage Crochet Trim and the sentiment is from Big on Birthdays. The girls from Just Add Ink were a little more creative than me with their projects, so head over to the challenge and take a look. We’d love to see your project starting with “R”. Oh my! Those yellow roses are absolutely gorgeous! Love, love, love! Another stunning creation, Narelle. I adore your layered elements and use of DSP, and those beautiful roses – so dang pretty, they really pop against the black and green.